AS IN CHOCOLATE MOUSSE. I ADOPTED HIM AT AGE 7, HE STARTED GETTING JEALOUS OF NOT ENOUGH ATTENTION THAT HIS BROTHER YOGURT AND HERSHEY WERE GETTING SO HE STARTED SPRAYING. SINCE I ADOPTED HIM, HES TURNED 9 THIS PAST MARCH HES BEEN SO GOOD, HES THE ONLY CAT OR PET I HAVE. I LOVE HIM, AND YES HE STARVES ATTENTION IS RIGHT NEXT TO ME ON MY LEATHER COMPUTER CHAIR. HE IS VERY VOCAL FOR SURE AND GETS HIS CATATUDE ALOT AND SCREAMS AND YELLS DOWN THE HAL AND RUNS LIKE A LITTLE ELEPHANT.HE IS A EXTREME WEDGE SIAMESE , IVE HAD HIMALAYANS AND THE REGULAR APPLEHEADS SIAMESE ALL MY LIFE, BUT THIS ONE TAKES THE CAKE FOR HIS STUPID ANTICS AND HOWLING AND BEING SO AFFECTIONATE ESPECIALLY TO ME, BUT LOVES ANY ATTENTION HE GETS. 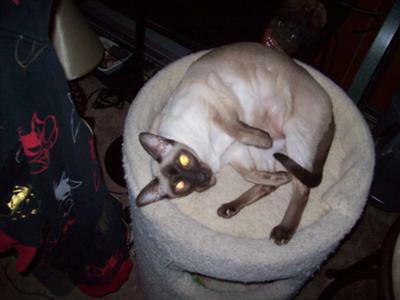 SO THIS IS MY SPECIAL MEEZER. HE HAS WON THE UGLY CAT CONTEST, YES I GOT A GOOD SNEAK PIC OF HIM, ALSO HALLOWEEN PICS, DRESSED HIM AS A PIRATE. I HAVE HIM DRESSED IN ALOT OF OUTFITS FROM A TURKEY, SANTA CLAWS ETC JUST CHECK OUT MOUSSE THE SIAMESE CAT. HE KINDA LIKES ITS GETTING DRESSED UP. WELL ME AND MOUSSE ARE SAYING HI TO ALL THE KITTIES OUT THERE , HES ON CATSTERS ALSO AND MY CAT SPACE. NOW YOU KNOW I LOVE MY CAT..